Golf Grip vs Golf Stance: What's More Important? Golf Stance vs Golf Grip: What's more important? There can be no doubt whatever that the first mistakes a golfer can make are to hold the club with a defective grip and to stand up to the ball the wrong way. Either puts a heavy impost on a player before he makes a move to swing the club. Together they make a good shot almost impossible. Any shot, of course, is measured by two standards. One is direction, the other is distance. Direction is governed partly by the position of the club face at impact and partly by the path the club head is following. Distance, on the other hand, is the product of club-head speed and the accuracy with which the head makes contact with the ball. These, in turn, are produced by body, arm, and hand action during the swing. But the position of the club face is largely determined by the grip, and the path of the club head is influenced considerably by the stance. "The position of the club face is largely determined by the grip, and the path of the club head is influenced considerably by the stance." The grip, to a very large degree, determines whether the face will be square to the direction line, open, closed, or even hooded, therefore whether the ball flies straight, is sliced, hooked, smothered, or even skied. Any one of these shots brings trouble, and with trouble the strokes begin to mount up. That is why the pros will tell you that the grip is the most important single factor in the game. 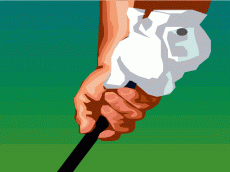 Gene Sarazen has said the grip is 75 per cent of golf. To him and the other pros it is, because they have all the distance they need. They make the moves that bring distance—make them automatically, and have made them since they were kids. A change of a couple of millimeters in the placing of one hand on the grip, however, producing better direction, could make, for them, the difference between a 69 and a 65. People do all kinds of peculiar things with both the grip and the stance, even to the extent of changing both after they have been taken. You've often seen a player stand up to the ball with both a stance and grip that were good, and then start to fiddle around. He changes his hands a little, then moves his feet a little. Then moves his hands another little bit, then shifts his feet again. By this time the grip no longer is a good one and neither is the stance. We once had a pupil who was a pretty good player and who learned easily; he had a peculiarly good faculty of doing just what he was told to do, without arguing about it. It was no trick for him to take a good grip and stand up to the ball perfectly. The trick was to make him hit the ball before he changed either of them.